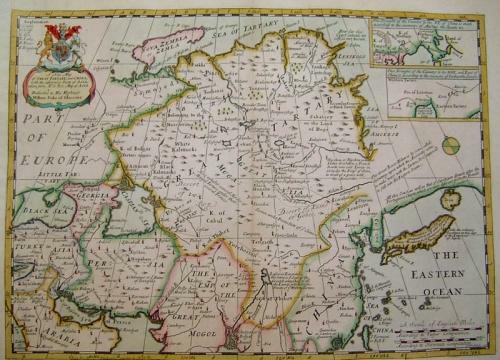 Title: 'A new Map of Great Tartary and China...' from 'A New Sett of Maps both of Antient and Present Geography', an atlas compiled by the geographer and mathematician Edward Wells (1667-1727). The maps of this atlas are dedicated to the young William, Duke of Gloucester, Queen Anne's last surviving son and heir to the throne. William studied geography under Wells, but unfortunately died in 1700 at the age of 11 just as the first maps of the atlas were published. Wells designed his maps for instructional use in the geography courses he taught at Christ Church College at Oxford and his clear and direct cartographic presentation proved popular with the general public as well. Something of a surprise commercial success, the atlas received several printings well into the 1730s. While examples of one or the other of these maps are quite scarce. The map is in good condition although it has been rebacked and has a modern left margin.